With its normal perspective, fast maximum aperture, and high-end design, the Planar T* FE 50mm f/1.4 ZA Lens from Sony is easy to see as a go-to standard optic for full-frame E-mount shooters. Starting off with the fast f/1.4 maximum aperture, photographers and videographers will enjoy exceptional low-light performance along with the ability to create shallow depth-of field effects. The Zeiss Planar optical design benefits users by providing an almost distortion-free image, while the incorporation of one Advanced Aspherical, one aspherical, and one extra-low dispersion element work to minimize spherical and chromatic aberrations. On top of that, the legendary Zeiss T* anti-reflective coating combats flare and ghosting for crisp, clear imagery. Performance is top notch as well with speedy autofocus provided by a ring drive Super Sonic Wave Motor (SSM) system. An AF/MF switch is provided for quickly changing between the modes and an internal focus design maintains overall lens length during use. A physical aperture ring is present on the lens which can be de-clicked at the flip of a switch, making this a great option for video in addition to stills. An eleven-blade circular diaphragm further improves image quality by ensuring smooth bokeh at a wide range of aperture settings. Additionally, a dust and moisture-resistant construction will keep you working even in less than ideal environments. Based on the Zeiss Planar optical concept, this lens uses a design with 12 elements in 9 groups that helps achieve the large maximum aperture of f/1.4 while helping to minimize chromatic aberrations. A normal-length prime designed for full-frame E-mount mirrorless cameras, this 50mm f/1.4 is also compatible with APS-C models where it will provide a 75mm equivalent focal length. One Advanced Aspherical (AA) and one aspherical element are incorporated into the optical design for effective control over astigmatism, field curvature, coma, and other spherical aberrations. One extra-low dispersion element is featured in the lens design to help reduce chromatic aberrations and color fringing for improved clarity and color neutrality. A ring drive Super Sonic wave Motor autofocus system and internal focus mechanism provides quick, quiet, and precise autofocus performance and also contributes to more natural, intuitive manual focus control. An AF/MF switch is located on the lens barrel for tactile control over this setting. Rounded eleven-blade diaphragm contributes to a pleasing bokeh quality when employing selective focus techniques. Planar T* FE 50mm f/1.4 ZA Lens is rated 4.7 out of 5 by 53. Rated 5 out of 5 by Anonymous from Fantastic 50 I guess I was one of the first ones who jumped on this lens. My experience with the lens has been wonderful. As one of the reviewers said, it reminds me of Summilux 50mm f/1.4. The image quality of the lens such as color, contrast, and bokeh is second to none. It is definitely heavy, but it never diminishes its quality. The lens feels much like Zeiss FE 35mm f/1.4 in handling and weight. However, the image quality is a bit better than the 35mm in my opinion. The autofocus makes noise somewhat similar to, but less than GM 85. The autofocus speed is fine. Despite the downside of the lens, it feels like Lux 50 with autofocus. Rated 5 out of 5 by Kris from Absolutely the best 50mm I have shot with When I got into the Sony mirrorless game, I quickly purchased the 55mm 1.8 which is such a nice compact and sharp lens. After using this 50mm and comparing it my 55mm imagine how much more sharper and just beautiful results I received. Yes its, $500 more than the 55mm but trust me when I say, its completely worth It and even more! If any of you guys have shot with the Zeiss Otus line of lens' you would know that those are the best in the game......but this 50mm is probably just as good at the Zeiss 55mm Otus. That is saying a lot, because the Otus 55mm 1.4 has a price tag of $4000. Bottom line: If you care to have the best/sharp lens. This 50mm will completely make you fall in love. Rated 5 out of 5 by Michael from Sony FE 50MM 1.4 pairs prefectlywith the 85G Master 1.4 Ok! so I have most if not all the Sony glass for the E-Mountsystem. 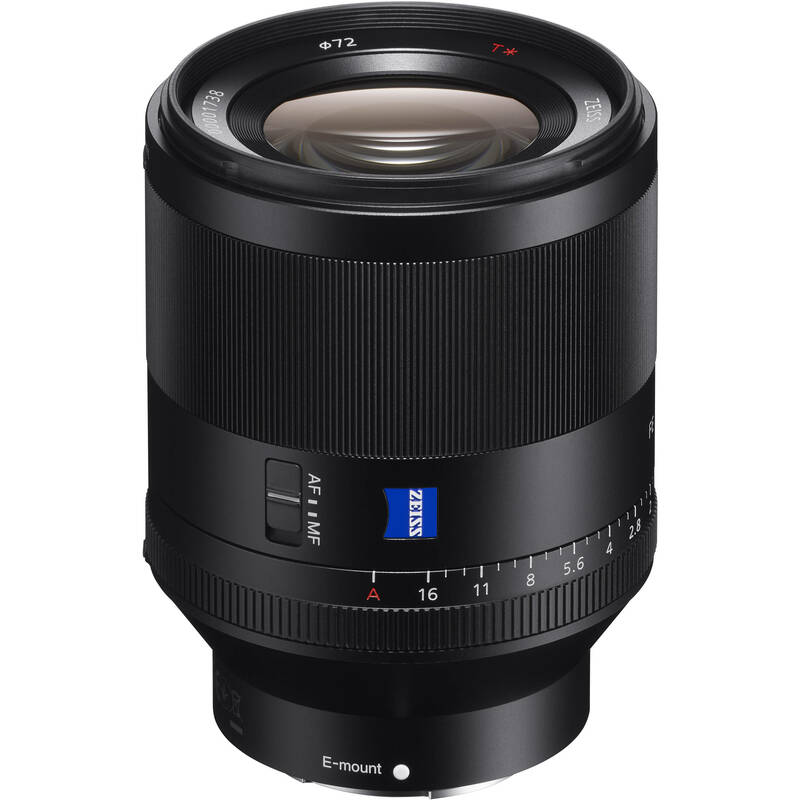 I bought this already having the Zeiss 55mm 1.8 which is a very good lens but it has some limitations comparingit to the Zeiss 50mm 1.4. The Zeiss 50mm is the best 50mm for the E-mount system hands down. This is a lens you'll pick up first if you like the 50mm focal length. It's a lens that will step above your expectations and allow you to create stunning images. Out of all the primes lens in the Sony nativeline-up if I had to have three lens the Sony Zeiss50mm 1.4 FE would be one of them without a doubt. Along with the 85mm G Master 1.4 FE and the last one being the Sony Zeiss 35mm 1.4 FE again Native primes. I hope this helps and Great Job Sony. Rated 5 out of 5 by Johnavon from Good glass is large, look at the otus line. This is a pro level lens, I've walked around with it on my a7rII with a hand strap and taken hundreds of photos and the weight is not an issue for me. The lens hood does make the lens look like a freaking telephoto lens and it draws a bit more attention than the 55mm zeis 1.8 which is also a great lens. But this beauty has basically no distortion, hardly and CA, and is SUPER SHARP WIDE OPEN at 1.4. I recommened turning off e-First curtain in your settings and you can see a difference in the boken rendering, you don't need to turn it off but the boken looks different wide open...more smooth with regular shutter, more hard bokeh with the electronic first curtain shutter. It's hardly a negative or really noticeable, or a negative! Love this lens! Rated 5 out of 5 by Alan from Zeiss has a winner I'm normally a Leica user, but I have an A7RII as my backup camera. I usually use an adapter to put my Leica glass on the Sony, but I wanted to give this lens a try as my sole autofocus lens for those times when I don't have the time to autofocus. I've been impressed by this lens. It is every bit as much or not more sharp than the Leica lenses on this camera. It has amazing contrast and colors. It has some real character that the very clinical high end Nikon lenses I used to own just never had. The only knock would be that autofocus is pretty slow in low light, and the af-assist lamp in the camera is blocked by this lens because of its size. I won't really knock this lens for its size. It's huge, but it delivers amazing results. It balances well with the A7 if you have the battery grip on. Rated 5 out of 5 by Brian from Very....special...lens If you want that Leica look for your Sony,get this lens. I was on the fence because the 55/1.8 has been my go-to,I love that lens a lot! But this one...it is amazing! I recently had a Leica with the 50 Summicron & this one's results are very similar! How can an image be tack sharp yet have a lovely glow about it? I dont know but this one does. Focuses fast too! Its really on a different level. If you shoot 50(I do for full length portraits etc) then this one could be the best in the world. I havent tried the 50 Summilux but I bet this Sony 50 is close. Plus its really not that heavy. Rated 5 out of 5 by Hatef Y. from Stunningly sharp, effectively perfect optical quality This blows away my Canon 50mm f/1.2. It focuses faster, it's sharper, and the rendering and color are gorgeous. Pairs very well with the 35mm f/1.4. Although it's big and heavy, it's certainly more compact and half the weight of the 24-70 f/2.8 GM zoom. For portraits, low light and beautiful color rendition, I can't imagine anything that can compete with this lens. Steve Huff was right, this is the best 50mm lens ever made.